1. In a large saucepan over medium-high heat, sautÃ© onion and garlic in oil/butter until tender. 2. Stir in salsa, chili powder, cumin, cinnamon, and salt. 3. Fold in chicken/turkey; remove from heat and set aside. 4. Working with one tortilla at a time, spoon 2 tablespoons of beans down the center of each tortilla. 5. Top with a scant 1/2 cup of the chicken mixture. 6. Fold the top and bottom of the tortillas toward the center, then roll up the sides. 7. Secure with wooden toothpicks or pieces of spaghetti noodles if necessary. 8. 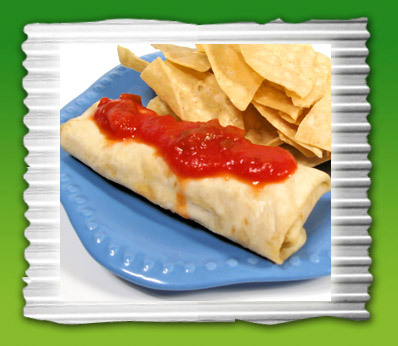 Place chimichangas in a 13″ X 9″ X 2″ baking pan, seam side down. 9. Spray all sides of the chimichangas with a light coating of cooking spray. 10. Bake in a 450Â° oven for 20-25 minutes, or until golden brown and crisp, turning after 10 minutes.